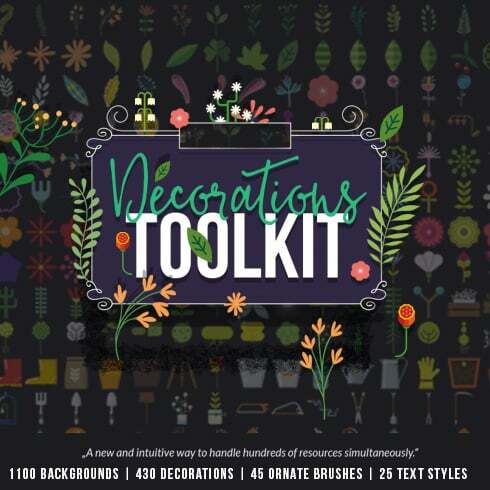 The Decorations Toolkit brings a new and extremely efficient way to handle and work with hundreds of resources simultaneously. You can now access all the items directly from Adobe Illustrator, anytime you need them. Just two clicks away. Are you working on a project already? Simply bring them up and select what you need, quickly and easily. More than that, there is no drop in your computer’s performance when you do this. To access those libraries, the panels offer a quick access via Library Menus. Now, how cool is that? Valued at $4,300, this amazing toolkit can be yours for only $49! Act fast because the 99% off discount won’t be here forever! If you are a graphic web designer working on multiple projects concurrently, you, like no other folks, see the importance of the whole package of design components at hands. Hunting for them one at a time, you may spend much time and expense . To obtain all the needed components in a single pack, we highly recommend experimenting with graphic bundles. A bundle is actually a assortment of design elements needed for graphic design, priced at a large amount of money, yet offered at a bargain price tag for a very limited time. What types of Decorations Toolkit are there? The assortments of elements accumulated into a graphics bundle are generally categorized as outlined by their purpose and / or kind. There might be packages with business card templates, icons and wedding invitation templates, etc. In addition, you may also be able to find graphic deals specifically for Halloween, St. Valentine’s Day or Christmas. The advantages of graphic packages for designers are quite obvious. But if you are a newcomer to those elements and still have doubts, the following information and facts will probably be of great help for you. 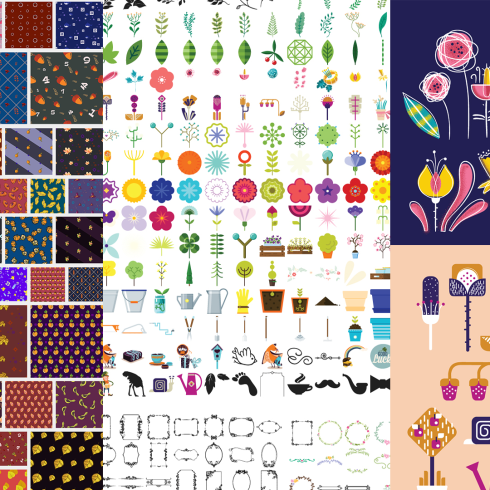 Along with a great number of the components in a single pack, the collection gives you a chance to use several of them for a number of projects. What’s more, the cost is usually cut down tremendously which allows you to save some cash, yet get the whole set priced at hundreds or thousands of dollars. The best way to spend significantly less bucks on MasterBundles.com Decorations Toolkit? Are you interested in a 5% discount on any package from MasterBundles? It’s not that hard. What you need to do is just share the page with a package on social media (Facebook). Once completed, the discount is going to be instantly added to your current cart. MasterBundles could offer you a large assortment of different products. MasterBundles.com offers not only graphics packages but also about 20 other different types of goods. Fonts, WordPress themes, mockups, icons, photos, illustrations, presentation templates and much more – on the MasterBundles.com you’ll be able to find most of the graphic elements, required for a design project creation. Content on websites which include infographics are much more legible and popular than those that do not. A special package for infographics is handy as it offers a ready-made option. The graphic designer just has to mix the images and there you are! Living in the digital era, many of us spend virtually half of our everyday life within social media networks like Instagram. It doesn’t matter what purpose we strive to reach on this network, we would like to be noticeable in a crowd amid countless identical accounts. With premium Instagram design templates offered at MasterBundles.com, you won’t need to spend eternity building the outstanding appearance of your page. A different package deal additionally well suited for photographers belongs to photo deals. Here on MasterBundles you’ll find a bulk of goods for picture retouching. Should you need PS actions, photo overlays, Lightroom presets, or other resources for working with photos, you have come to the right place. What is a watercolor graphics package deal? The watercolor bundle is known to be the lovliest development in artistic desgin. Painted by artists on the a piece of paper, the wonderful pictures get scanned and included in a package deal as design templates for design projects. Watercolor elements are just excellent for posters, blogs, wedding invitations, DIY and greeting cards. All images are highly detailed and ready to print or use in a digital way. MasterBundles is a website that gathers top offers from over the internet and lets you purchase the elements you need in your work for for less money. Bundles this excellent website carries are limited in time, and that’s the reason they are so cheap. 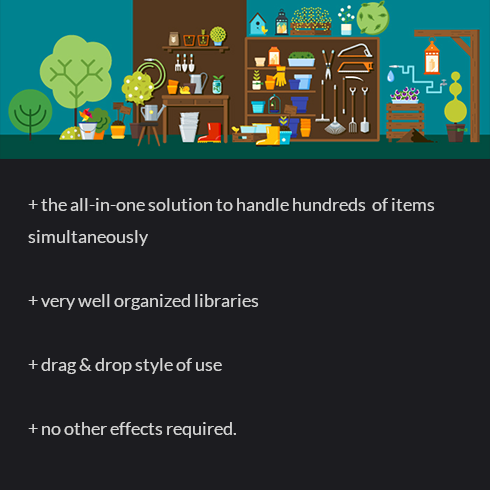 MasterBundles also has a great blog with the useful design features detailed. If you were hunting for a handy website packed with excellent offers – MasterBundles is there for you!